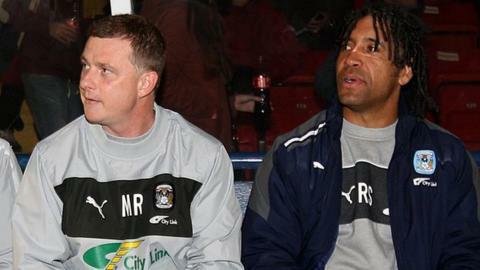 Coventry City boss Mark Robins insists the decision to sack assistant manager Richard Shaw was the right thing to do. Shaw was sacked on Tuesday, only 27 days after Robins took over. "It wasn't an easy decision by any stretch of the imagination in terms of Richard, because I liked him," Robins told BBC Coventry and Warwickshire. "But what I need to do is make sure I get the right people in the right places for the job that we want to do and the roles that I want fulfilling." He added: "That's the sole motivation behind it. "We want to take the club forward as quickly as we possibly can." In contrast to the four straight league defeats suffered by Shaw and joint caretaker manager Lee Carsley, Robins has so far done well. After starting with a home defeat by Carlisle United and a League Cup thumping at Arsenal, the Sky Blues have gone unbeaten in four games to climb out of the League One relegation zone. And they should have midfielder John Fleck and defender Richard Wood fit for Saturday's home clash with Notts County, both having come off in last weekend's 2-2 draw at Swindon. After suffering a facial injury for the third time this season, Wood admits that his family were concerned for him. "My kids weren't keen the morning after when they saw me," said Wood. "And my missus isn't very happy at all. "I just said to her that's what happens in football, we've just got to get on with it and I'll get my nose straightened in the summer. "I'm not one to roll about on the floor and moan about things. If I can get, I'll get up and play on. That's the way I've always been and I'm never going to change." Meanwhile, Coventry now know the identity of their Johnstone's Paint Trophy Northern quarter-final opponents in December. They will host Sheffield United, who won 4-1 at Notts County on Wednesday night. JPT Northern section draw: Crewe Alexandra v Doncaster Rovers, Bury v Preston North End, Port Vale v Bradford City, Coventry City v Sheffield United (ties to be played week commencing 3 December).